In a large bowl, stir together the butter, white sugar, and brown sugar. Mix in eggs one at a time, and then stir in the vanilla (although the instructions say to stir these ingredients together, but I used my hand mixer). In a separate bowl combine the flour salt and soda, then add to the butter mixture just until blended. Stir in chocolate chips (I used an entire 12 oz. package of chocolate chips...you can never have too many of those!). Drop by heaping teaspoonfuls onto ungreased cookie sheets, about 2" apart. Bake 12-15 minutes until edges begin to turn golden. Allow cookies to cool for a few minutes (I usually leave them about 5 min.) on the baking sheet, then remove to wire racks to cool completely. Note: I also live in a high altitude state, so I was thrilled to find a cookie recipe that had been adapted for our neck of the woods. However I did some research and found out that of course you can make this cookie no matter where you live, just omit the additional 2 Tbsp. of flour! I know that most people seem to associate Apple Crisp dessert with the fall season, but I love I all year long! Here is one I've made many times, and is easy to prepare. In a bowl combine the flour, rolled oats, brown sugar, and cinnamon. Cut in the butter until crumbly. Press half of the crumbly mix into a greased 9 x9 baking dish. Cover with the chopped apples. Ina large sauce pan combine the white sugar, cornstarch, water and vanilla. Cook and stir over medium heat until clear. Pour syrup over the apples, and sprinkle remaining crumb mix over all. Bake for about 45-50 minutes until the apples are tender. I like the apples to still be a bit crisp when finished baking, but if you prefer them to be tender, bake as long as 1 hour. I think you will love this simple crisp! This is a recipe I found while blog hopping, and it has such a quirky list of ingredients I knew I just had to try it! Core and chop up apples into bite size pieces. Cut candy bars into small pieces. In a large mixing bowl combine pudding mix and milk together, whisking until smooth. Add the apples and candy bars, and stir until everything is well coated. Fold in whipped topping, and then the marshmallows. You can serve right away, but we found we liked it better after the salad had chilled for a couple of hours. THE POST TITLE IS TRUE! I MADE BROWNIE'S USING DIET COKE! Now think about it...2 fabulous, delicious, (necessary) items brought together, and as impossible as it seems, made even better!! In a large bowl dump the brownie mix in. Open that can of Diet Coke (try not to drink any of it), and slowly pour over the dry brownie mix. It will foam up a lot. I stopped to stir in the soda a couple of times. Let them cool, cut them into 24 pieces and try not to eat the entire pan before the family gets home! I have also made this recipe using the low fat boxed brownie mix, and I'm not kidding, you can't tell the difference! Using the low fat mix, and cutting into 24 equal pieces, each brownie is 105 calories, and 0.5 grams fat. Check out their Saturday Linky Party!!! The next addition to OUR COOKIE NATION series! Yay! I must say, doing this series of favorite cookie of each of the 50 states was brilliant on my part...I get to make cookies, lots of cookies, with good reason, can't worry about the fat and calories, kind of brilliance! This recipe was the most popular one among the residents of Arkansas via AllRecipes.com. A very simple recipe,quick to make, fast baking, and quick cooling. You gotta love that. However, I thought this cookie was just OK. For me it was a bit bland, but after refrigerating them (because I thought they would be better cold), they got better. I also have the idea they would be truly great if you drizzled them with a lemon glaze. In a small bowl measure the powdered sugar, and set aside. In a large mixing bowl pour the cake mix, eggs, oil and lemon extract and mix well. Drop by teaspoonfuls of dough into the bowl of powdered sugar, rolling them around until they are lightly covered. Once sugared, place them on ungreased baking sheets, and bake 6-9 minutes or until the bottoms are a light brown, and the insides chewy. As I'm sure you can all tell, my family and I love pasta. We have it at least twice a week, and sometimes more often. My son Chase is a HUGE fan of pasta with Alfredo sauce, and you can find his favorite recipe here: Awesome Alfredo Sauce. I am a big fan of tomato based sauces, and this recipe brings the 2 together in what is probably the best, simple and quick, very adaptable pasta casserole ever! Have I mentioned that I am a huge fan of Cavatappi pasta? Love it! I use it almost exclusively in place of all tube pasta's. The reasons I love this pasta are many, but the main 2 are the denseness(?) or thickness, and the cute curly design-lol! And truly this pasta holds sauce really well, so it makes each bite more substantial-yuuum! 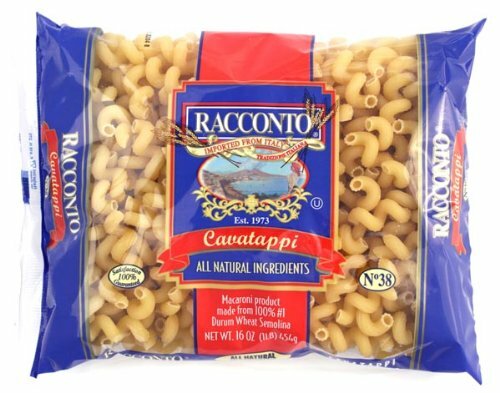 This type of pasta is a bit difficult to find in my local grocery store's, so I purchase it on Amazon...I know, who purchases pasta from them, right? 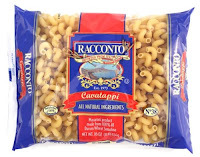 Racconto Cavatappi Pasta and it's a really decent price! In a large mixing bowl combine the 2 pasta sauces, making sure they are well incorporated. In a second mixing bowl combine the softened cream cheese, milk, salt, pepper, and Italian seasoning. You may want to add a bit more milk if the cream cheese is still really thick. The consistency should be close to sour cream. In a 9 x 13 baking dish that has been lightly coated with non-stick cooking spray, place 1/2 c. mixed pasta sauce and spread over bottom of dish. Place 1/2 of the cooked pasta into the dish, then pour 1/2 of the remaining sauce over noodles. Lightly spread the cream cheese mix over the pasta & sauce, layer remaining pasta on top, then remaining sauce, and finish by sprinkling the shredded cheese over the top. Loosely cover with foil and back for 30-35 min. until hot and bubbly around the edges. Cook 5-10 minutes then serve. Isn't this a great pasta? Note: You can use any tube pasta in place of the Cavatappi, and think about adding cooked chicken, hamburger, broccoli, or other ingredients your family would like between the layers of pasta. I use rotisserie chicken often, and I love to layer cooked spinach in this as well. 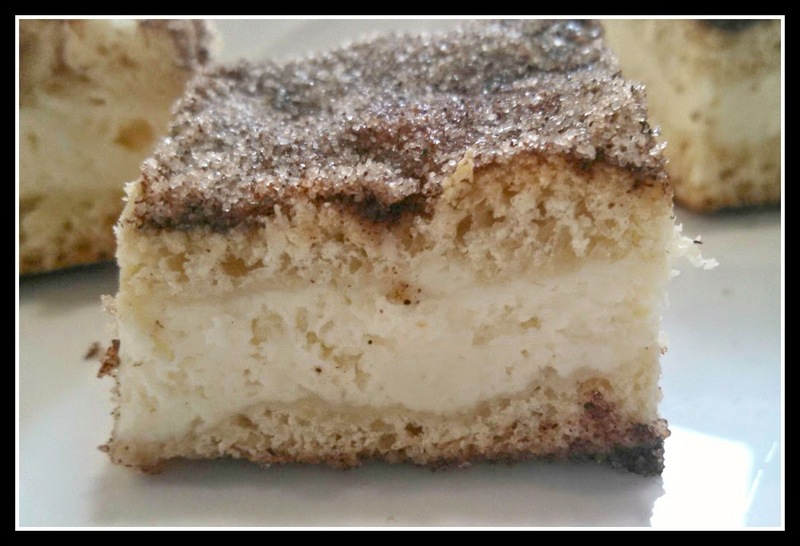 I originally saw this recipe on Hoosier Homemade's Blog, and I have been dying to make them. They are really lovely, and although the recipe title is actually Twix Bar's I really thought they were more of a cross between a Twix candy bar and a Reeses peanut butter cup. Whatever you want call them, they are fabulous! Lightly spay a 9 x 13 baking dish with non-stick spray. Using approximately 24 crackers, line the bottom of the pan. In a medium sauce pan mix together these first 5 ingredients, and bring to a boil stirring often. Continue to boil 4 minutes (The sauce will be a caramel color and pull away slightly from the side of the pan). 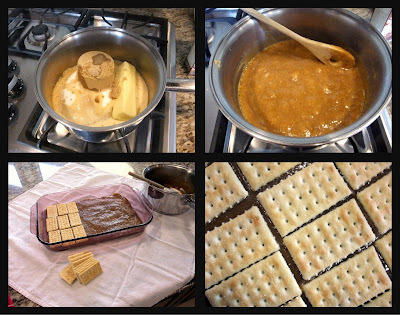 Pour caramel over the crackers, smoothing out evenly. Place a second layer of crackers onto of the caramel, and press down slightly. Place these 2 ingredients in a microwave safe bowl and microwave for 2 minutes. Stir well. If chocolate is still a little lumpy, microwave in 15 second increments stirring between each time. Once smooth, Pour over second layer of crackers, smoothing to edges of pan, and chill again until chocolate is set. (At this point, the original recipe calls for you to chill the chocolate topping until firm and then frost the crackers, but I wanted to take the simpler way out-lol). 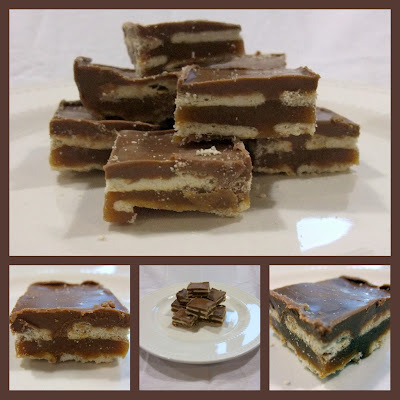 Cut into cracker size pieces and enjoy! Store in the refrigerator. I love blog hopping. Sometimes I dream about it. It can consume hours of my time yet I feel as if only a few moments have gone by. I mean I REALLY love blog hopping. There is an endless universe of information, creativity, tutorials, inspirations and idea's. And then I get to the food blogs...I'm obsessed. Seriously. I read cookbooks like they are novels, so I knew I was in serious trouble when I discovered FOOD BLOGS! OMG! I am in love! I may need an intervention just to pull me away from licking my computer screen with all the awesome food pictures in blogger recipe world! Enough about me (at least for the next 5 minutes)! There are so many wonderful recipe blogs out in the blogosphere, that it's easy to miss some of the fabulous, quirky, cute, sweet, innovative, gourmet, and the simple food treasures, and I can't have that!!! So I have a fun series that I am going to kick off today by "spotlighting" some of these blogs! I have been following Urbakinmecrazyy.blogspot.com for a couple of weeks now, and I really think you should get to know Megan a little more! 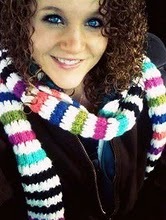 She is a 15 year old (truly adorable) girl living in Darke County Ohio. Her blog is fairly new, but she has some fun posts to read, and more than 20 great recipes already posted! I love the fact that this talented 15 year old young lady is inspiring others, including me, to be in charge of your own future, enjoy what you do, and create something you are passionate about! Where do I live you ask? Well, I live outside of a dinky little “cornfield” town in Ohio. You know, one of those towns where everyone knows everyone. I absolutely love life in a small town. I enjoy life in the country, put me in the city and I’d feel out of place. What are your 2 favorite hobbies? Well the most apparent hobby of mine would be baking, and cooking. Aside from that, that’s a really difficult thing for me to answer, I enjoy doing lots of things. Though, if I were to choose another hobby of mine I would have to say sports. I used to play volleyball and softball; however I began online schooling this year and am no longer able to play. I honestly don’t remember exactly when I began cooking although I’m sure I was just a tiny little squirt. My Mom and Grandmother have always had me in the kitchen helping them make something. Are you the main cook in your family? At this point in time, I do cook dinner most nights. Not because I have to, but because I want to. The nights I don’t cook, my mom does! Tell us a little bit about your daily routine. On a typical day, the first thing I do is make breakfast. While eating breakfast I check my emails, Facebook, and Blogger. Then comes school work, just like any other high schooler I too find school BORING!! Therefore, I cannot wait to get it done and over with. Around noon I eat lunch, then I try and find something to do with the rest of my day, this typically involves cooking or baking! Twice a week, typically Thursdays Fridays or Saturdays, I work from 5-9 at a local restaurant (Farmer Brown’s) making sandwiches, pizza, and ice-cream. I LOVE it! I love working, and being able to make my OWN! What is your favorite thing to cook, and your favorite thing to bake…. Yet another difficult question this is for me to answer, as I love making all sorts of things. My most favorite thing to cook would have to be Lasagna. I love assembling all the yummy layers of cheese, noodles, and meat sauce! As for baking, I love to bake cakes! SUPER tall layer cakes to be exact… I don’t get the opportunity to make cakes very often, but when I do I go all out. When did you start blogging about your cooking? I first started blogging about my cooking in November of 2010. Why...Probably because I have this obsession with reading food blogs and I wanted to have one of my own. If you could only have 1 food for the rest of your life, what would it be and why? If I could have only one food for the rest of my life, it would be chicken. I love chicken, it’s so versatile. My favorite way to eat chicken is grilled with Weber’s Kickin’ Chicken Seasoning and Worcestershire sauce! This is something that I have never really thought about. In ten years I hope to see myself married, with children living on a small farm with horses, cows, pigs and chickens. I see myself having graduated college with a degree in Social work, specializing in Child and Family Services. My dream would be to own my own bakery. What is your favorite food ever? My favorite food ever would have to be, chicken! Like I said before chicken is just delicious and there are so many different ways to prepare it. Here is a recipe Megan has made especially for Aunt Peg's follower's. Does this look divine, or what?! 1. Heat the oven to 350 F and spray an 11x7-inch pan with non-stick spray. 2. In a medium bowl whisk together the flour, baking powder, baking soda, salt, and brown sugar until well blended. 3. Add in the butter, egg, egg yolk, and vanilla and mix until smooth. 4. Turn the batter out into the pan and press it evenly into the pan. It will be quite thick. 5. In the same bowl beat together the cream cheese, corn syrup, vanilla, butter, brown sugar, salt, egg, and flour until smooth and lighter in color. Fold in the pecans. 6. Carefully spread the topping over the base and bake for 35 to 40 minutes, or until the filling is puffed and the edges are set, but the center is just a little wobbly. Cool completely in the pan. Slice, and enjoy. Visit Megan's blog and become one of her followers. I promise you will never be sorry! Thank you Meggs for sharing your corner of the world with us, we've really loved getting to know you! This is a quick and easy recipe that we love. It's versatile and easily adaptable to your family's likes. I wanted to have pictures to accompany this recipe, but my family had the frittata eaten before I could locate my camera, yet again! In a large mixing bowl combine baking mix, all the seasoning, and Parmesan cheese. 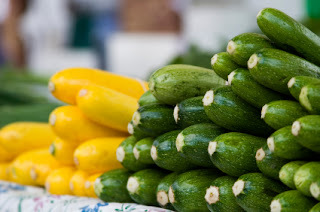 Stir in the zucchini, garlic and eggs. Continue stirring until very well mixed together. Spread into a 9 x 9 baking dish or a 9 x 13 baking dish if you prefer the frittata to be thinner. Bake for 35 minutes for the 9x9, or 25 minutes for the 9x13 dish. 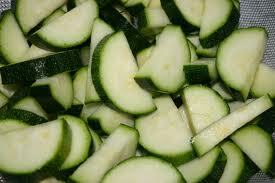 Slice and serve with salsa and sour cream (or try a small dollop of warm spaghetti sauce on it). This dish is really wonderful hot or cold so it's a great dish for a brunch, lunch, or dinner meal. Note: Add some bacon, ham, or cooked, diced chicken if you want. This is great with grated cheddar or mozzarella cheese sprinkled over the top during the last 10 minutes of baking. In our Our Cookie Nation Series, this was the cookie recipe for the state's of Utah and Arizona. I must say that I'm proud to live in Utah! I have NEVER met a pumpkin chocolate chip cookie that I didn't love, and this still holds true with this new recipe. In the immortal words of Mikey's brother, " (S)he likes it! ".